It was time for a little trip to stretch our wings again and to see a different Abaco cay. 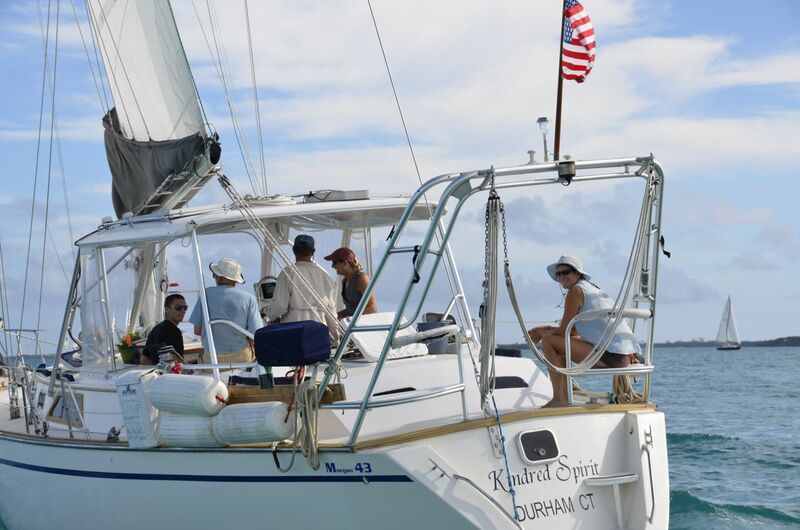 Cutting Class and Kindred Spirit departed Hope Town in the early morning for Great Guana Cay. Although it was a cloudy morning, we had a lovely and leisurely sail north the entire 12 miles, about 2.5 hours and anchored in Fishers Bay. 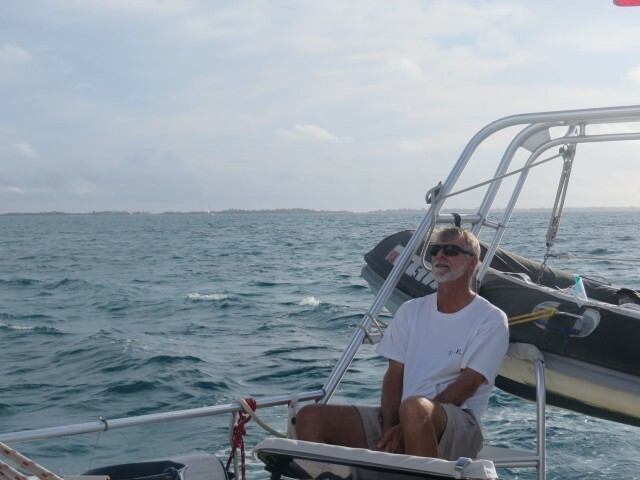 The Captain takes a little time out to relax on the back deck while underway. 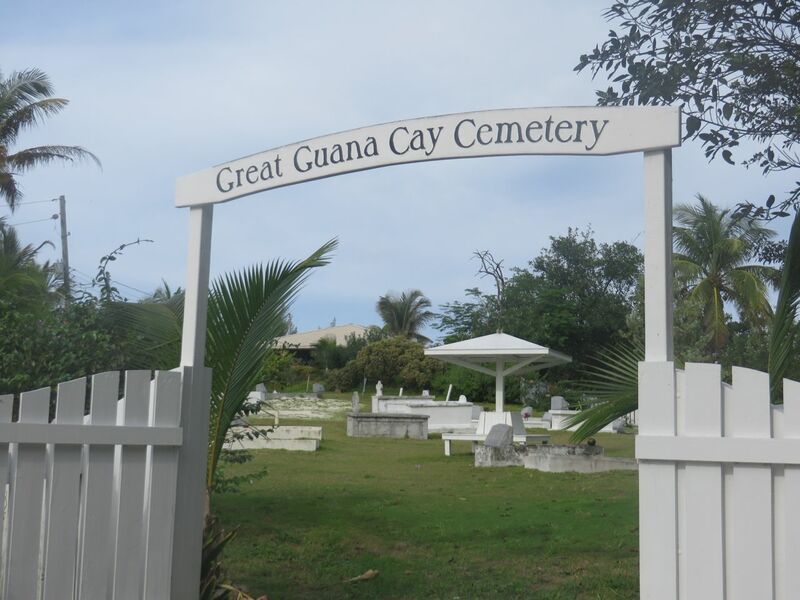 Great Guana Cay is one of the smallest settlements in the central Abacos, but is growing (95 people in 1990 census to 163 in the 2000 census.) Great Guana Cay’s rolling terrain has some higher hills than the average Abaco cay. 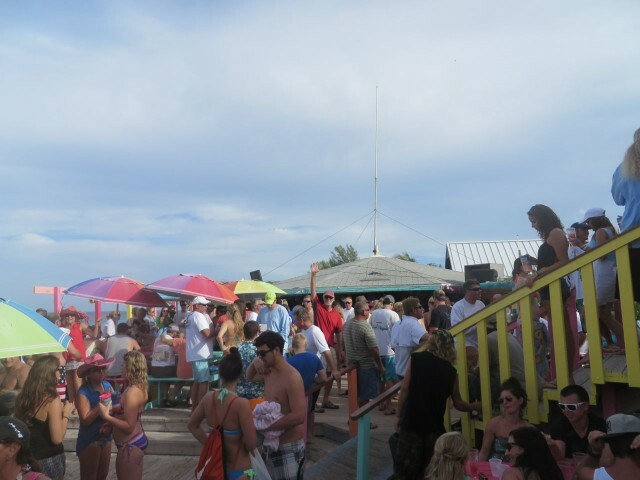 It is famous for its 7-mile long beach on the Atlantic side and its two beach bars – Nippers and Grabbers. (I’ll bet those names conjure up some images!) 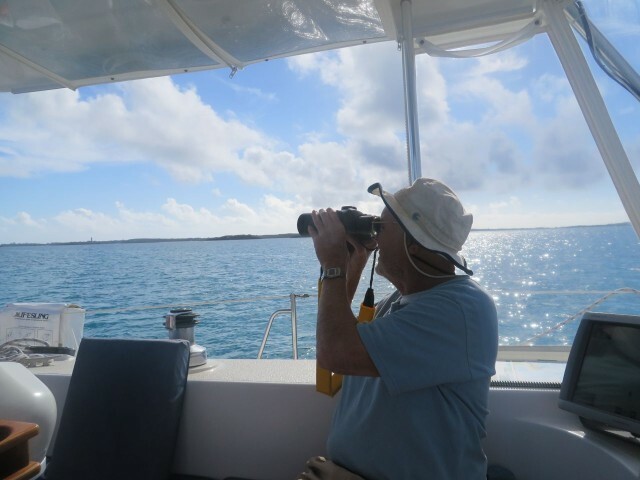 We can hear about the “happenings” at Nippers, Grabbers, and Dive Guana on the VHF cruisers’ net each morning so it was fun to visit the island. 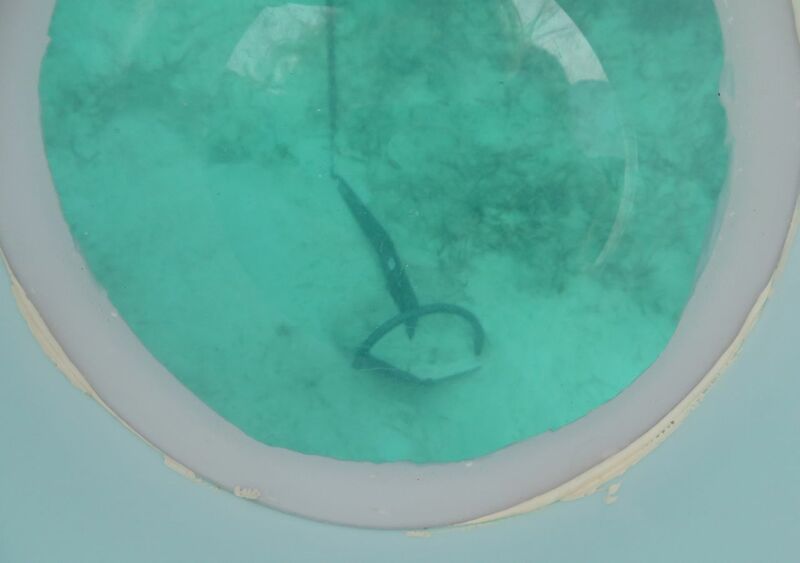 The water in Fishers Bay was so clear we could easily see our anchor, an experience we just don’t have up north. Taking a look at the rocna anchor through the look bucket. The “boys” decided to clean Kindred Spirit’s bottom. 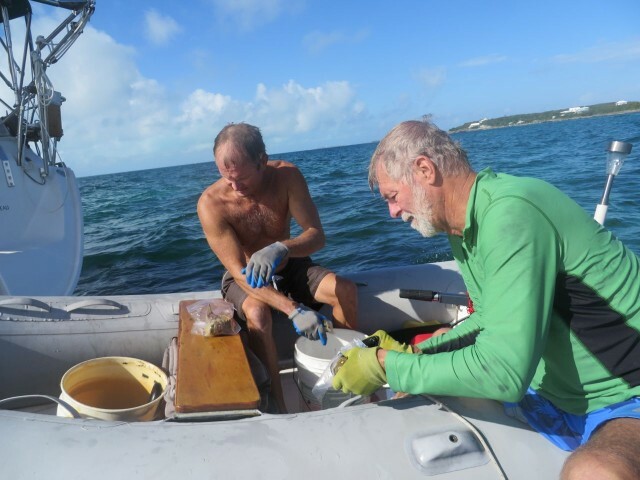 With Dan’s help, we now have a clean bottom, rudder, and keel. Cleaning the bottom, wearing snorkel gear. She looks really good now! Of course, Dan had to go lobstering – beware lobsters!! You are not safe while Dan is in the Abacos!! 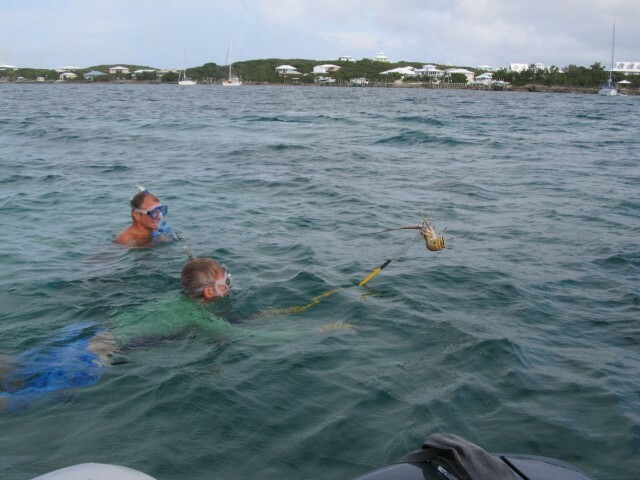 Dan speared four that morning. 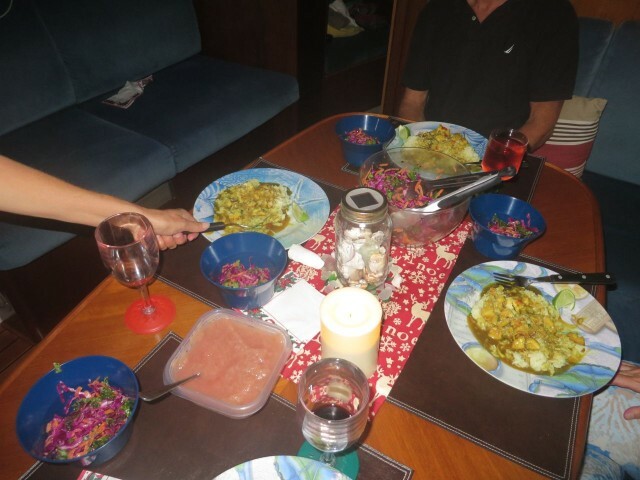 That said, we all ate well again that evening on lobster cooked in a delicious sauce with vegetables by Marcia. We took a walk around Great Guana Cay, with Dan and Marcia as our guides. 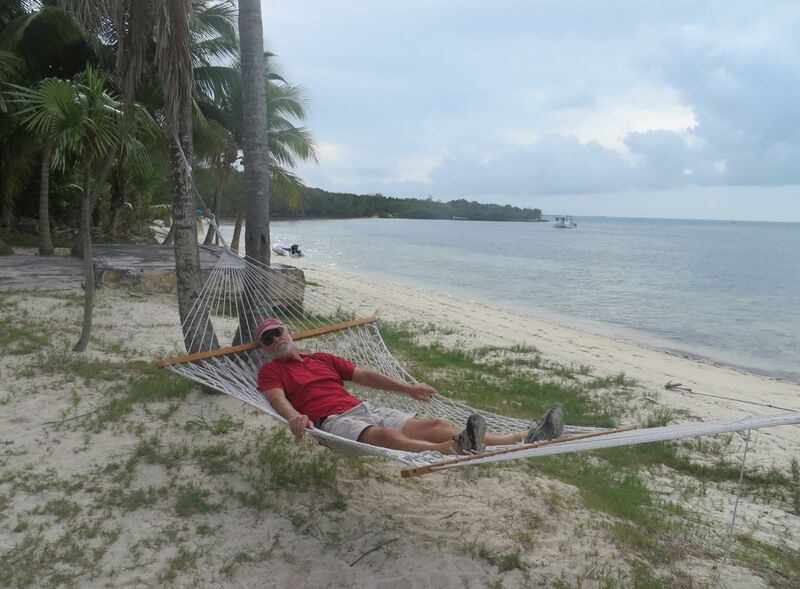 Al found a hammock right there at the beach, three steps from the dinghy – a doze in a hammock is his dream idea of a nap. 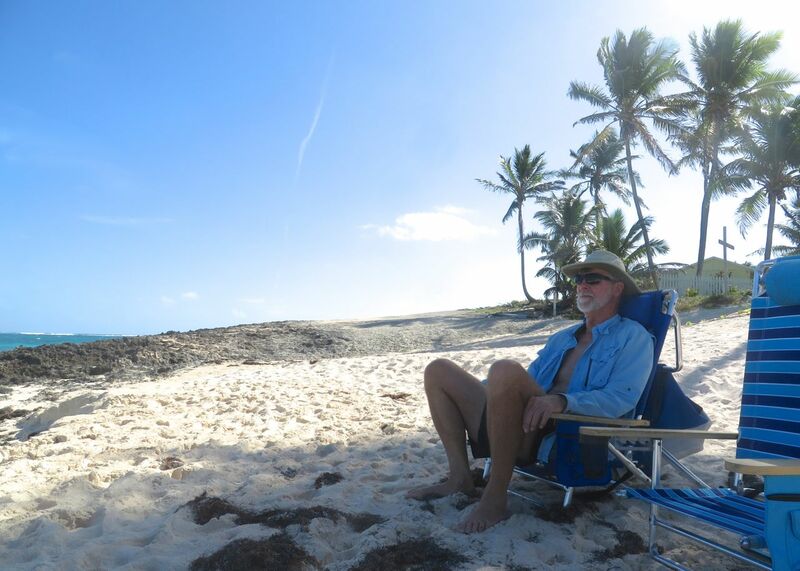 Al tests out the Grabbers’ hammock on the beach at Fishers Bay. Great Guana Cay has a couple shops and a little grocery store. Here we are in the Abacos and we ran into Clive and Herschel from Connecticut walking along the road. 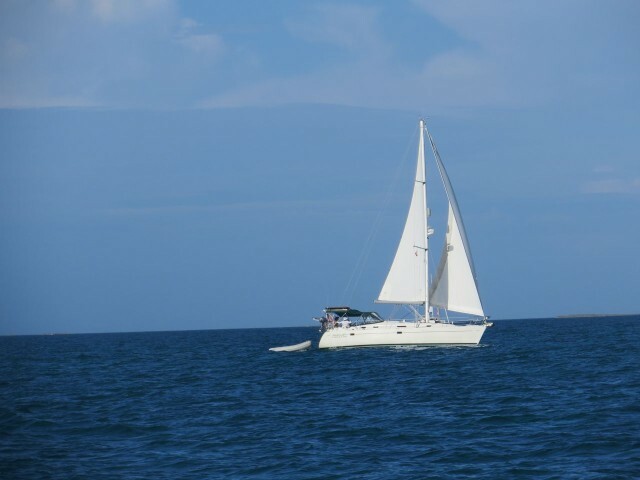 They are sailing on their boat, Sitara. Clive retired in June from another CT district as their math curriculum leader, so we had crossed paths back in those days. 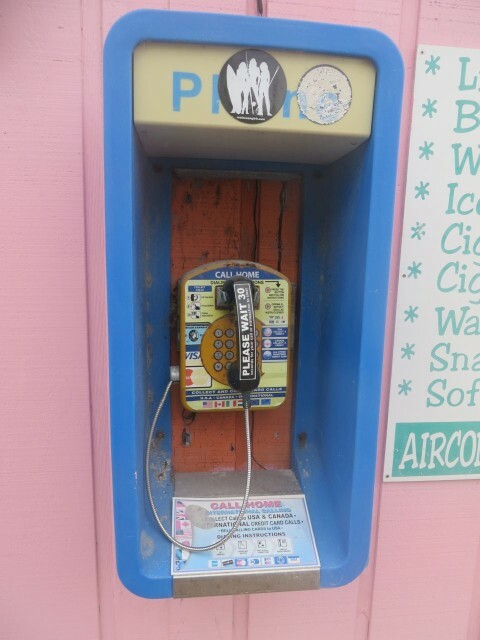 A pay phone! Some of you young folks won’t even recognize this. 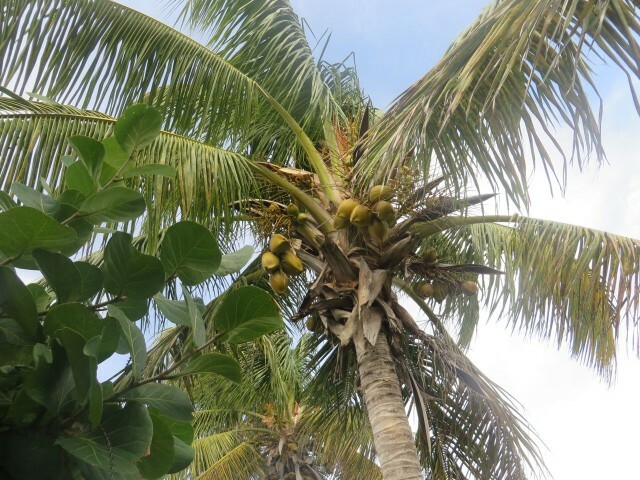 A bit of trivia – Dan says that more people die from falling coconuts than any perceived tropical or sailing dangers. 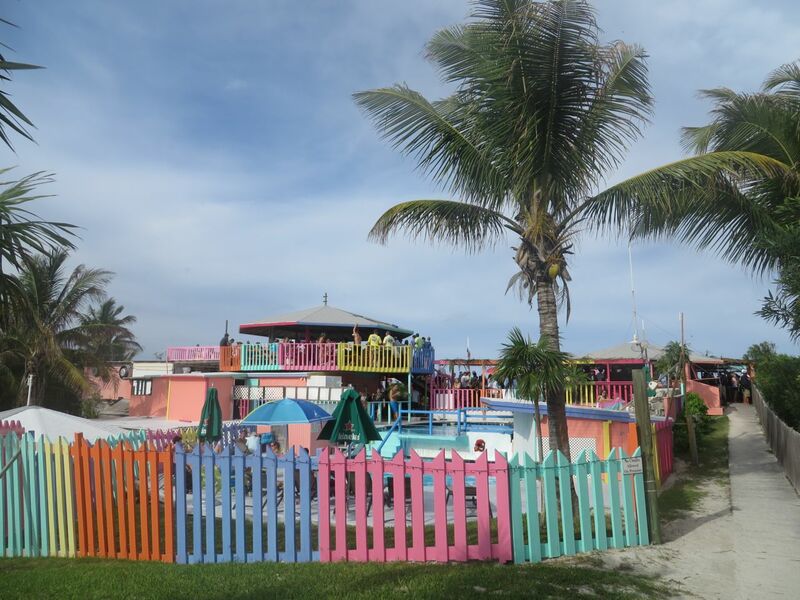 We walked out to the famous Nippers Beach Bar and Grill known for their Sunday “pig roast” – roast pork, barbecued pork, peas and rice, mac and cheese, corn, potato salad, cajun coleslaw, custard corn bread, fruit salad or watermelon. That sounds really neat, but when we got there, it was like “spring break.” Major sensory overload in many ways – music, gyrating bodies, drinks, people and more people! Where did they all come from???? Just not our style. Maybe another time, when it is not a Sunday, and not a holiday week. Just TOO crowded for us. 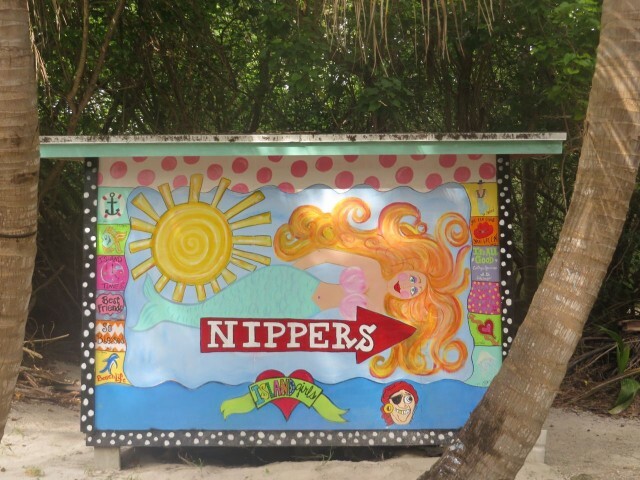 The sign for Nippers along the path – cute and colorful! And here are the crowds – and that is only in one direction. 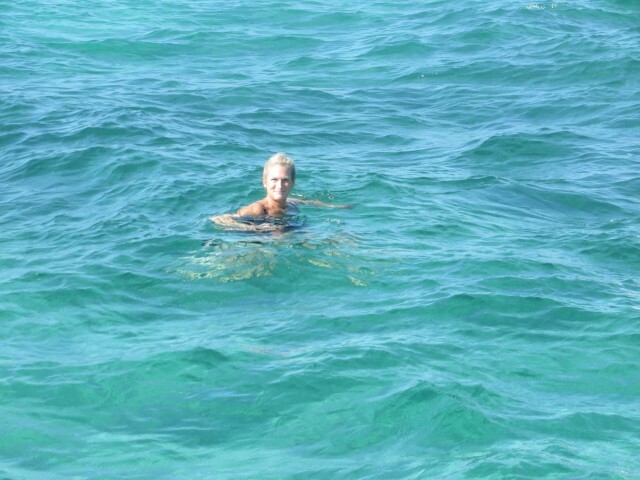 Can you see Al waving to me?? 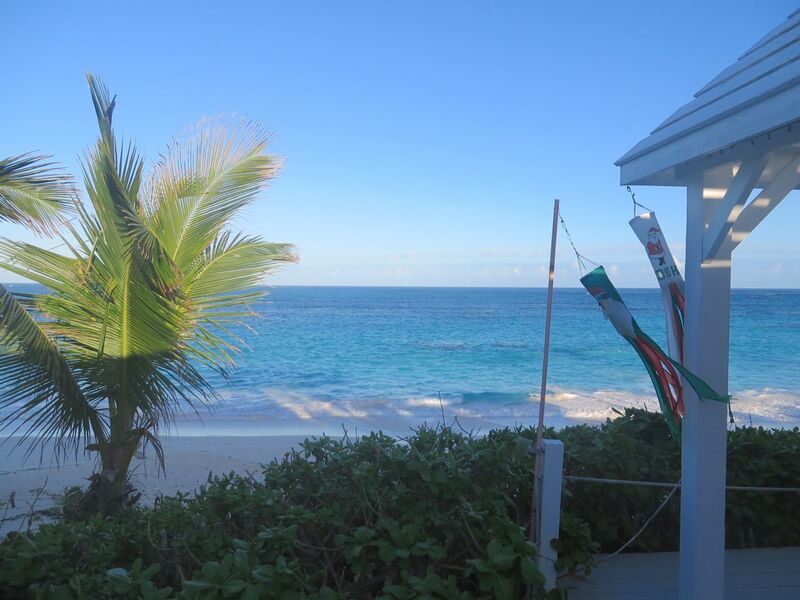 So, we headed back to Grabbers, a much quieter place to relax and have a beer on the beach. We played a rousing game of corn hole. Does this mean we are getting old? 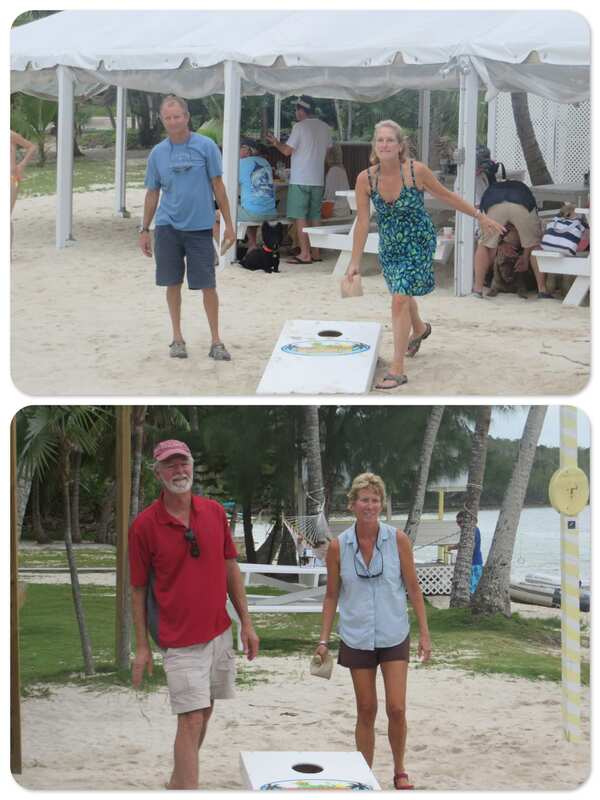 We prefer corn hole and one beer over the party scene at Nippers???? Nothing like a game of corn hole after a cold beer! We were treated to a softly lit sunrise the next morning. 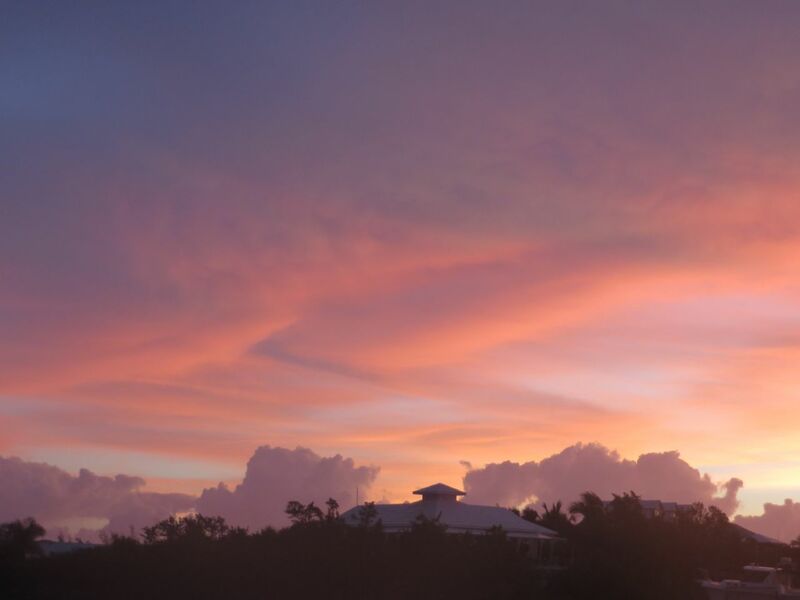 Soft pink and violet clouds begin the day for us. 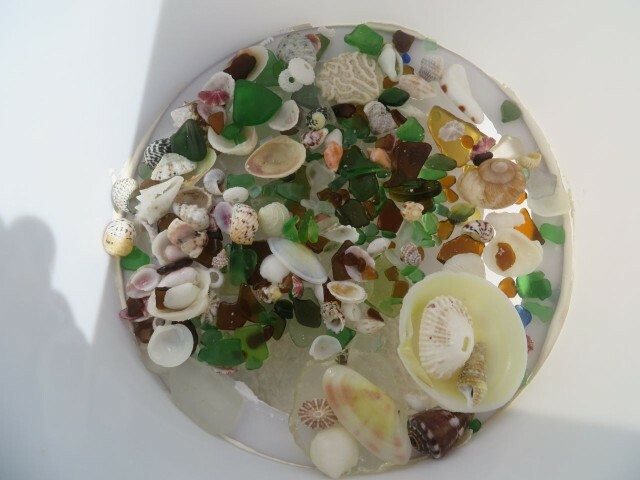 Shortly after breakfast we all headed off in our dinghies to go lobstering! When I say “lobsters” down here in the Bahamas, they aren’t exactly like our New England lobsters. These creatures are the Caribbean spiny lobster (Panulirus argus) a species in the southwestern Atlantic Ocean. They don’t have claws, but do have very long antennae. Spiny lobsters tend to live in crevices of rocks and coral reefs, only occasionally venturing out at night to seek something to eat. 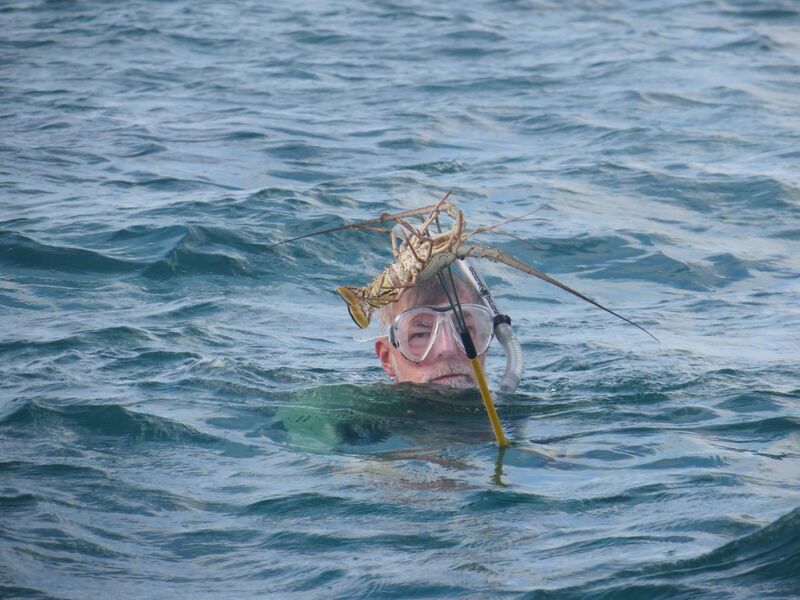 Like New England lobsters, spiny lobsters are edible, but aren’t as “sweet”, tasting more like shrimp. Dan catches the first one of the day! 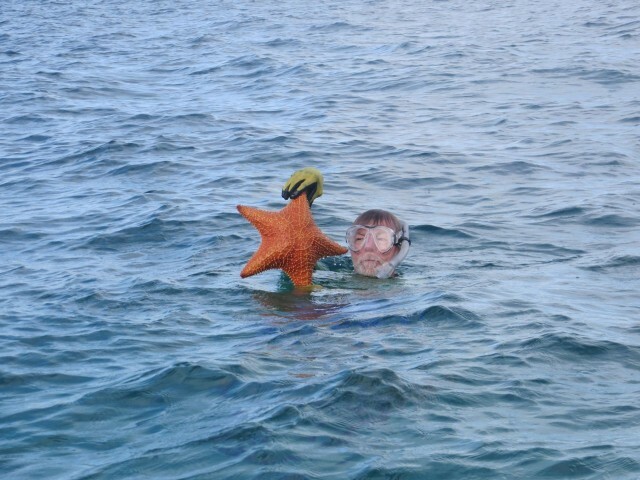 Al finds a very big starfish to show to me before he returns it to the bottom. 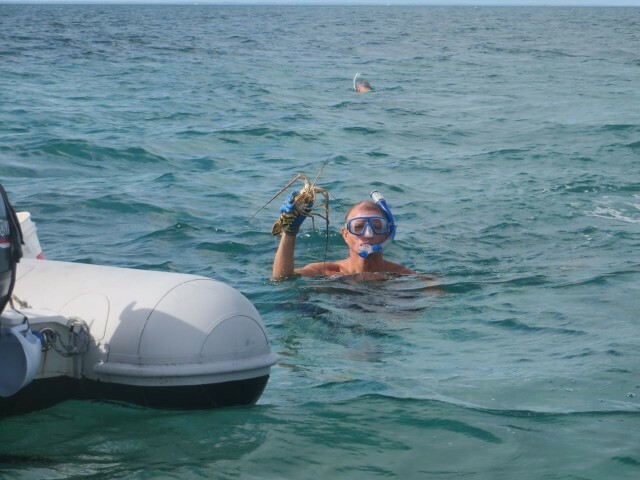 Al spears his first lobster!! 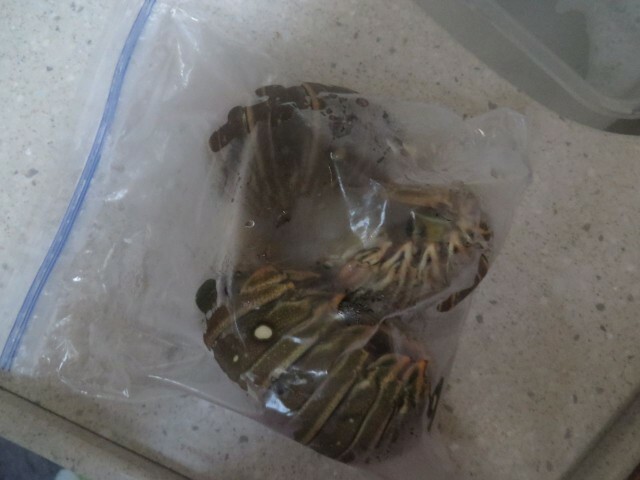 Our three lobster tails are bagged and put into the refrigerator. 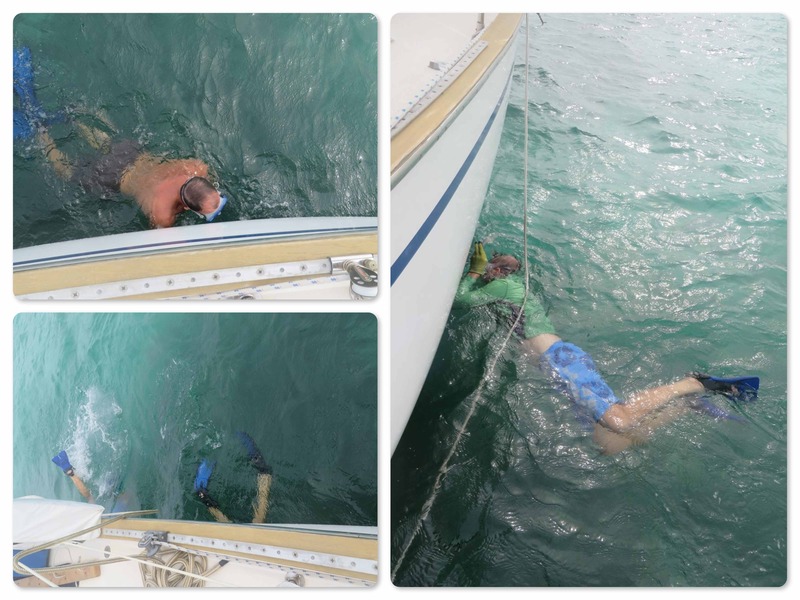 This is my idea of fun – swimming in the clear and gorgeous water right off the boat. We left Great Guana Cay around 2:00 pm to go with the rising tide back into Hope Town harbor. 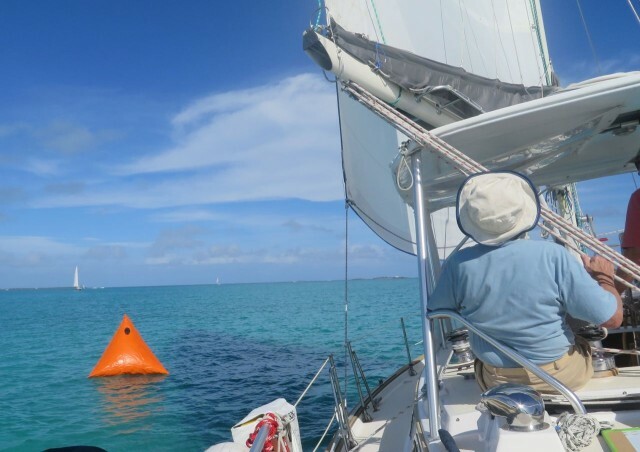 The sail back was even better than the day before. Should I say it again? 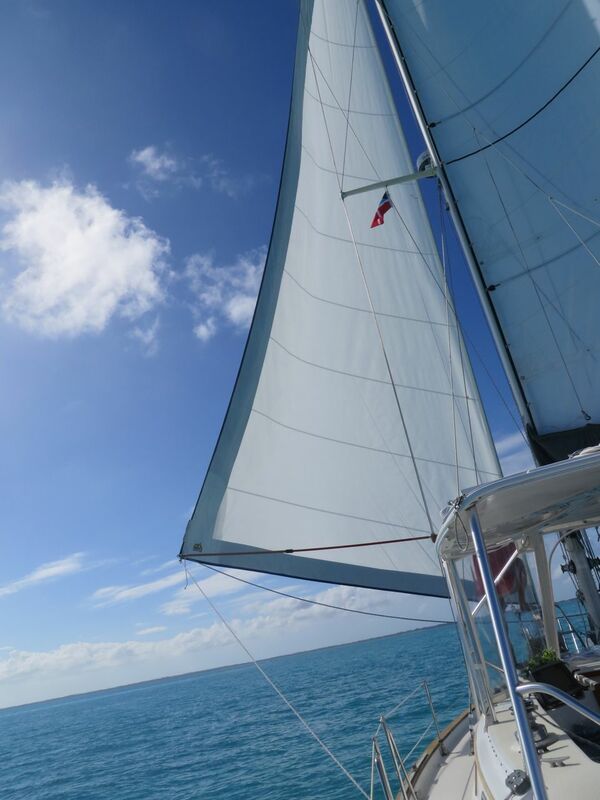 It is SO nice to sail. We cleaned ourselves up and prepared a feast for our dinner. 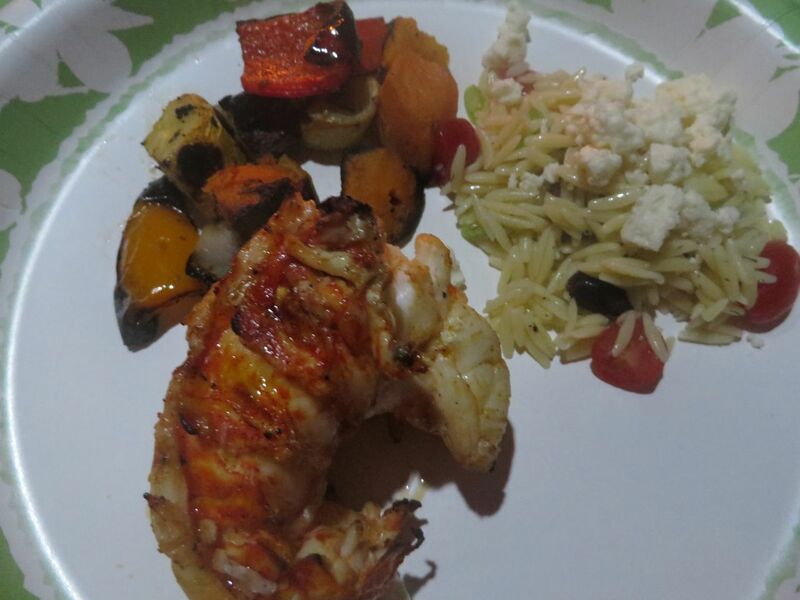 Cajun grilled lobsters tails with orzo salad, grilled vegetables, and brownies for dessert. No restaurant could have provided a better meal than this group effort. 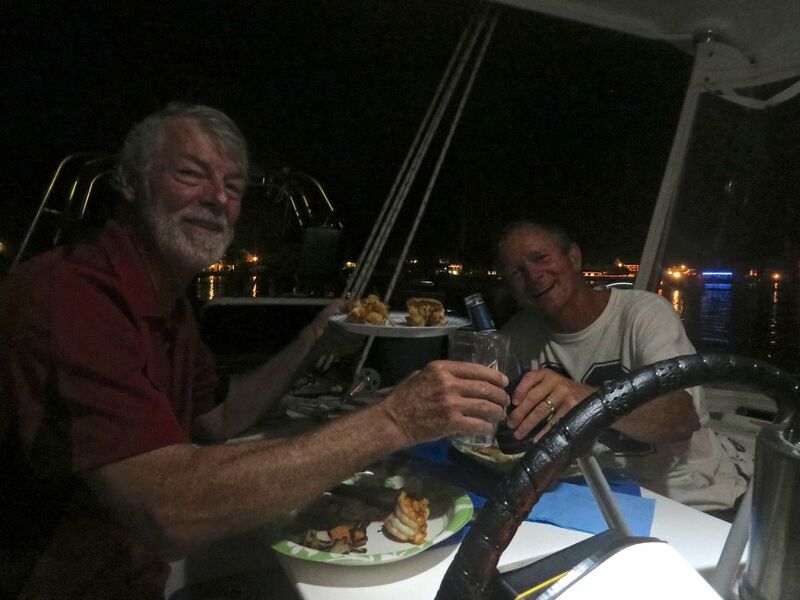 The hunters toast to a successful and very tasty day! Wow, this is turning out to be an awesome adventure trip. Boxing and Racing Day – Kindred Spirit takes 5th place! Boxing Day is traditionally the day following Christmas Day (December 26th), when servants and tradesmen would receive gifts, known as a “Christmas box”, from their bosses or employers. This custom has its beginnings in an old English tradition. Since servants would have to wait on their masters on Christmas Day, the servants of the wealthy were allowed to visit their families on the next day. The employers would give each servant a box to take home containing gifts and bonuses, and maybe sometimes leftover food. 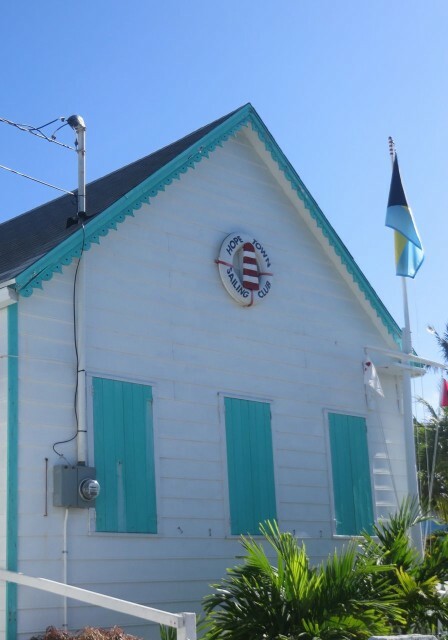 With British roots, the Bahamas, along with the United Kingdom, Canada, Hong Kong, Australia, New Zealand, Kenya, South Africa, and other Commonwealth nations, observe the holiday. 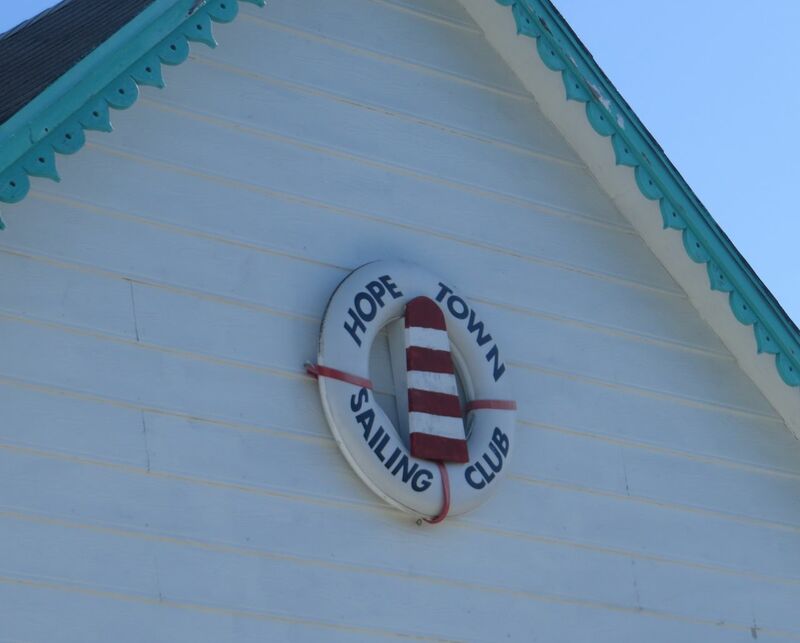 Here in Hope Town, Boxing Day is also the Hope Town Sailing Club’s H. Bowen White Race for cruising boats over 18 feet. First, let’s back up to last weekend. 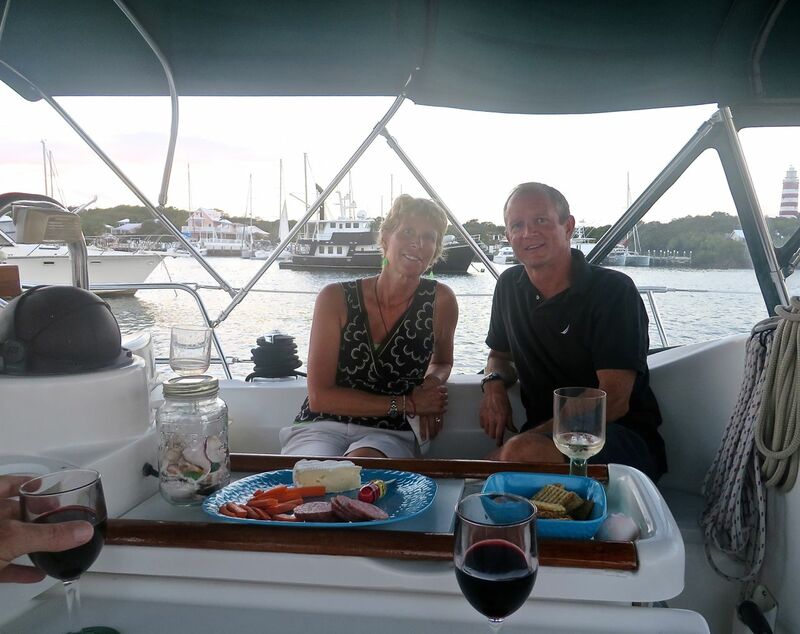 Last Saturday we were invited, as guests of Sara and Deanna, to the Hope Town Sailing Club. 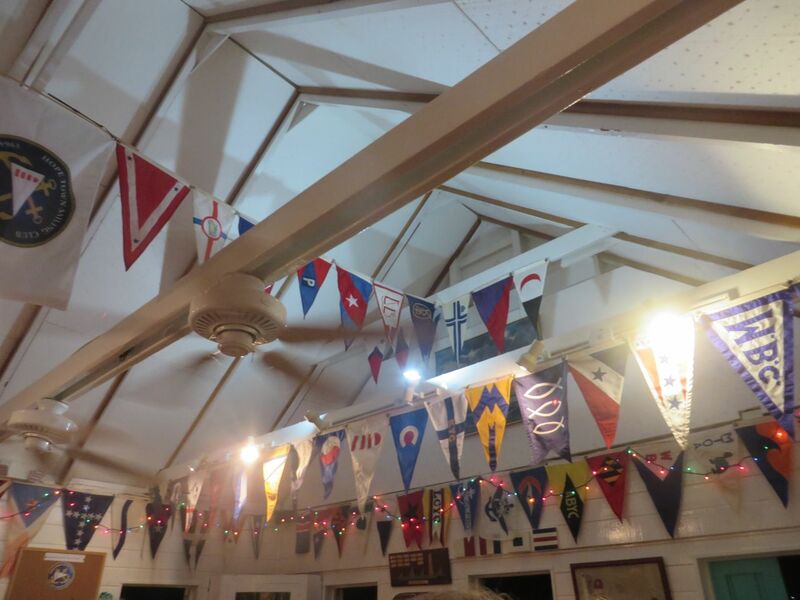 The event was a “stand up” which is a BYOB cocktail party in the clubhouse. Two or three members host and provide appetizers from 5:30 – 7:30 pm. 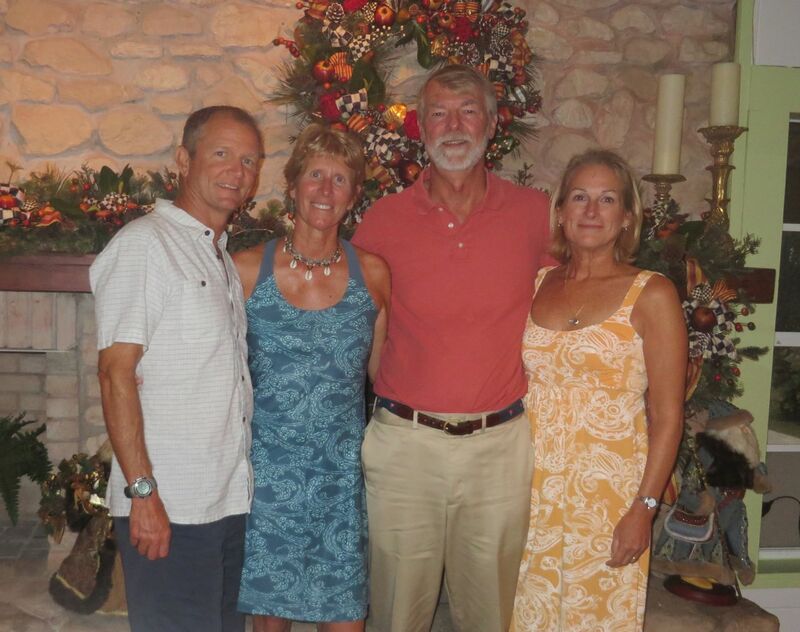 It was a great time and reminded us of our Shennecossett social events back home in Groton. Whitey (We met Whitey and his wife, Ann, the second evening we were here and already feel like we are old friends!) encouraged Al to race Kindred Spirit in the Sailing Club’s “H. Bowen White Race” on Boxing Day. Whitey did not have to twist Al’s arm very much! 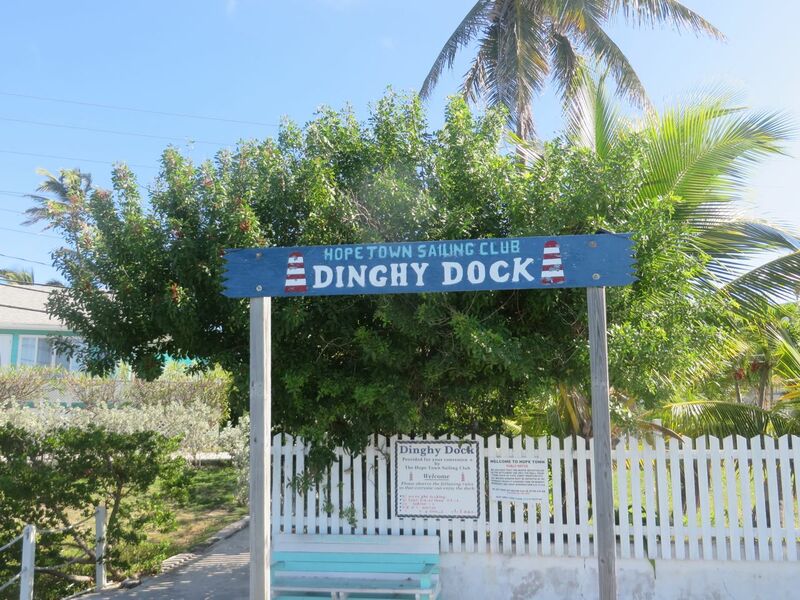 The Hope Town Sailing Club provides a dinghy dock for everyone. 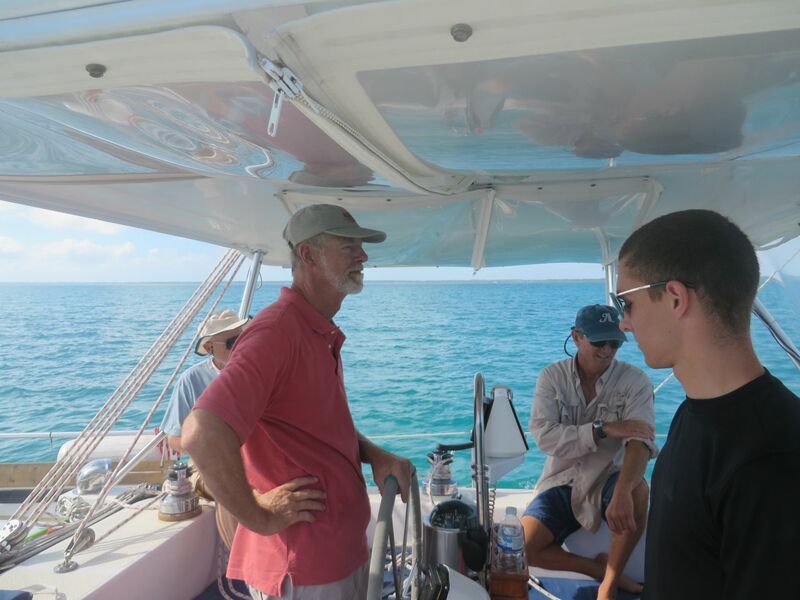 On Boxing Day, we attended the 9 am skipper meeting and picked up two of our crew members – Whitey and his grandson, Dave. 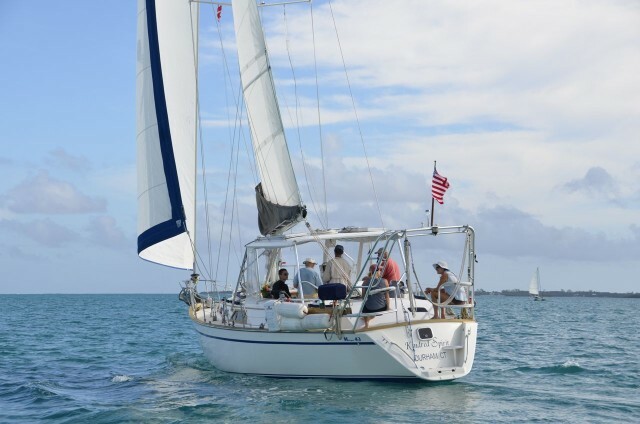 Along with Dan and Marcia, the six of us left the harbor and headed out to the racing area out between the Parrot Cays and Boat Harbor. 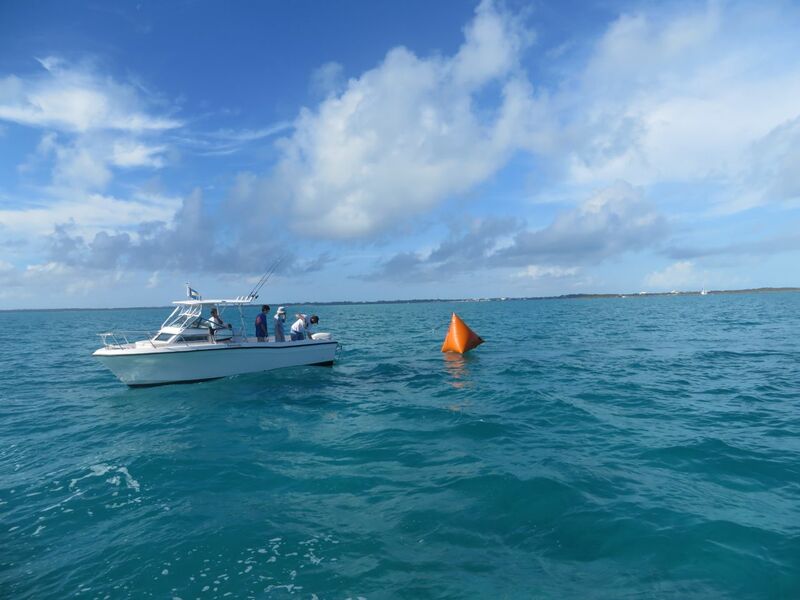 Remember, these are not familiar waters to us so we wanted to check the territory out. 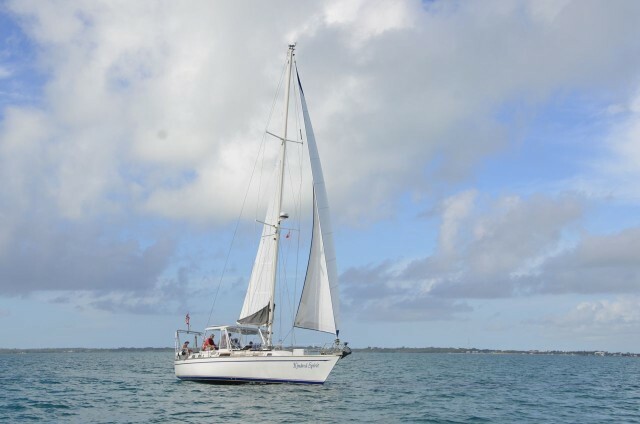 Fortunately for us, Whitey has been boating in these waters for over 40 years. Dan is on the bow, checking the depths as we exit the harbor in the channel on an incoming but still low tide. No problem! Five boats were racing – two J-boats (the older one was named Grumpy Old Man and the newer one, complete with fancy racing sails was named Grumpy Too), Spirit (Mark and Kim’s Tartan), and Quest (a trimaran). 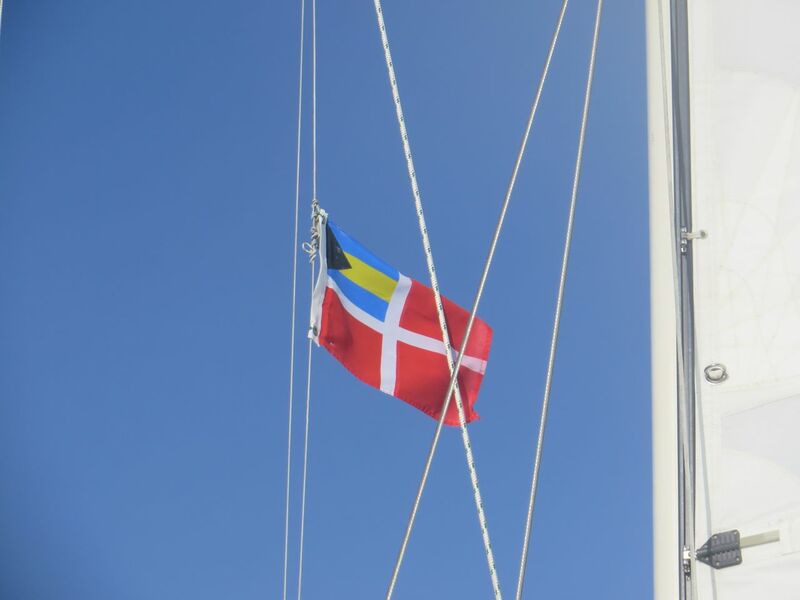 The very strong winds from Christmas Day had diminished to light winds predicted to be 5 – 10 knots. “Winds” is probably a generous term; it was more like a breeze. The “marker boat” drops one of the orange markers. Whitey is looking for the position of the other marks. Al has experience with racing back in our Catalina 34 days (I will brag that our C34 “little” Kindred Spirit with Al at the helm, won the Catalina 34 National Regatta when it was held in Connecticut back in 2000.) 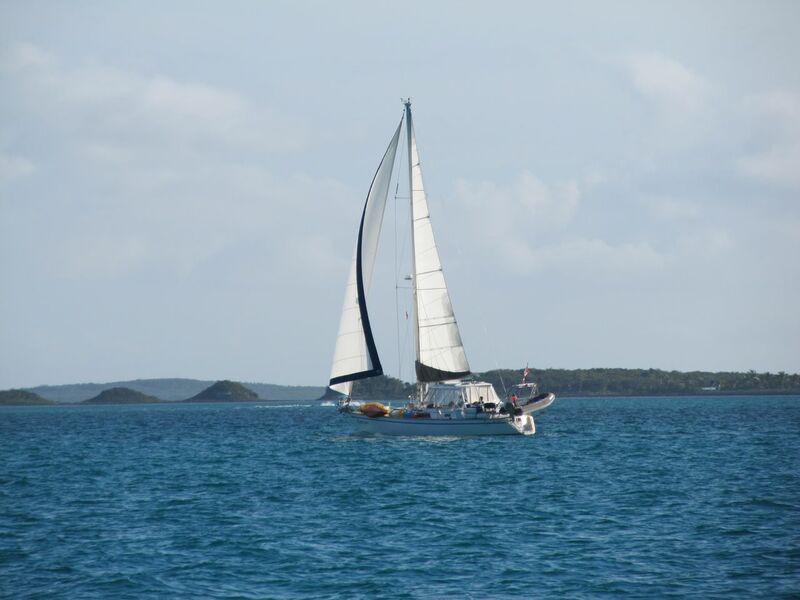 The first leg of today’s race went well, with winds of 5-10 knots. Kindred Spirit could move and make some progress in those winds. 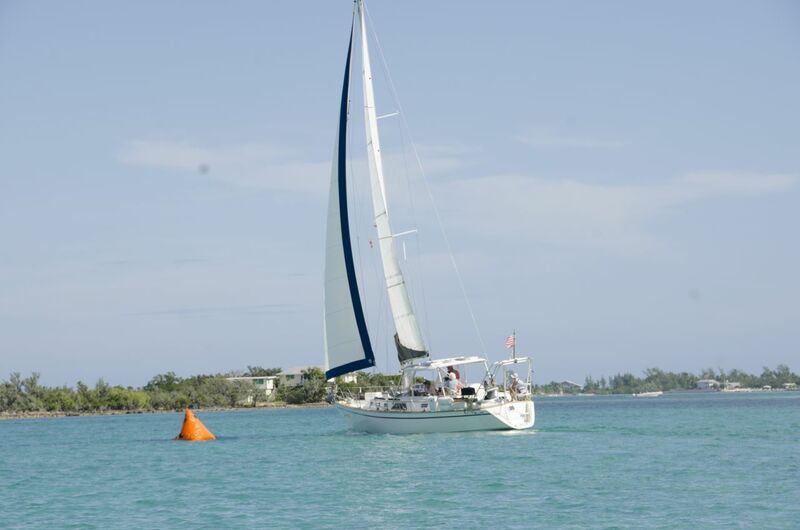 Spirit and Kindred Spirit shortly after the start of the race. Kindred Spirit coming up to the first mark. 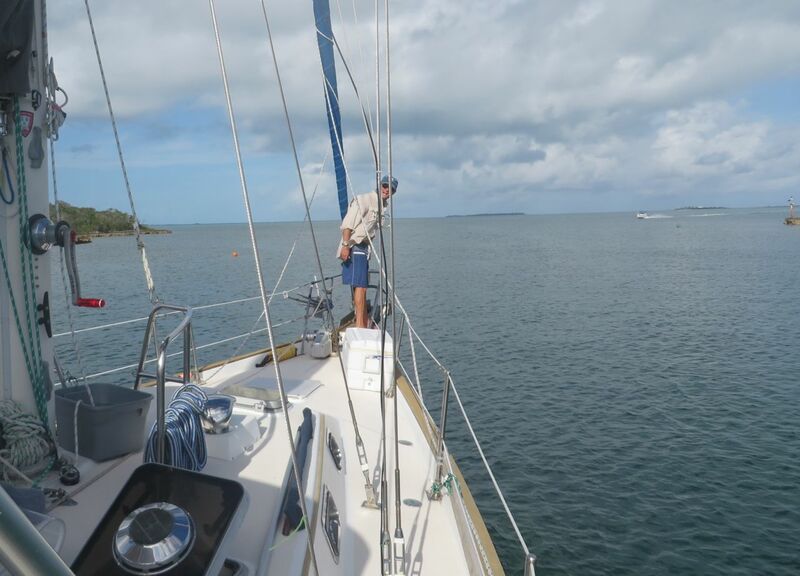 Here we go around, putting the mark on our port side (that’s the rule). 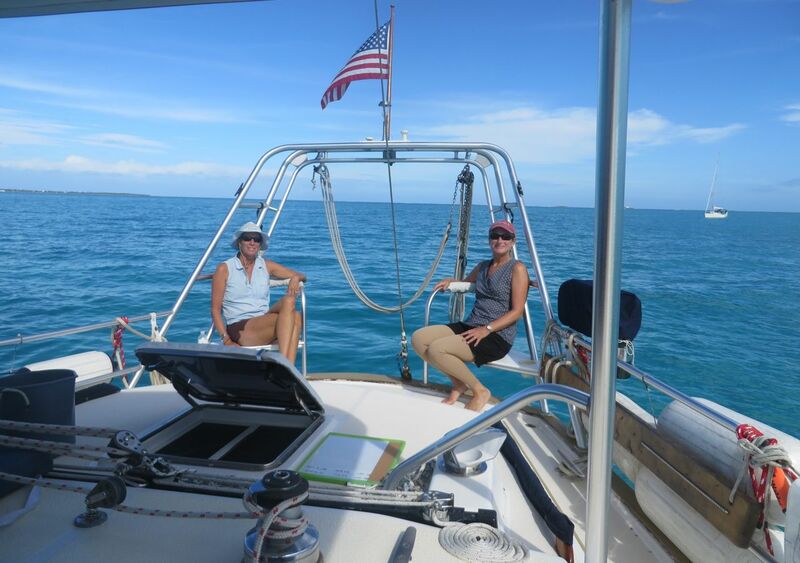 Marcia and I held positions on the stern, our own version of “rail meat.” Our back seat driving comments actually did help on one or two occasions. Right, Skipper? 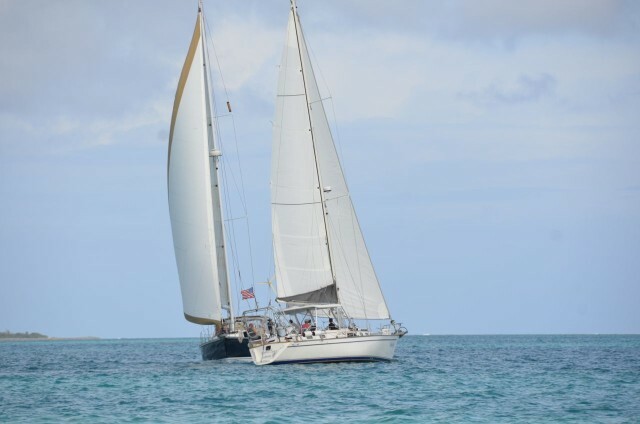 She looks good under sail, doesn’t she? 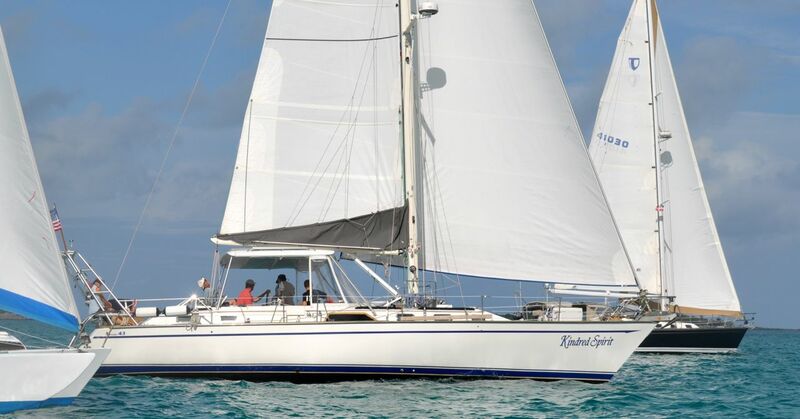 Ah, but alas, the breeze died to 0 knots during one leg. The race course was eventually shortened from 7 legs to 5 legs due to the lack of a decent breeze. It was a slow race from that point onward, taking us three hours to finish. 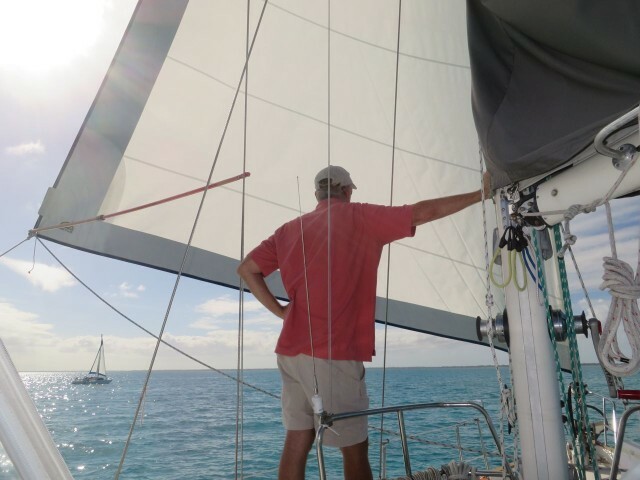 Skipper tries to keep that head sail out far enough to catch some air while trying a “wing on wing” downwind strategy. 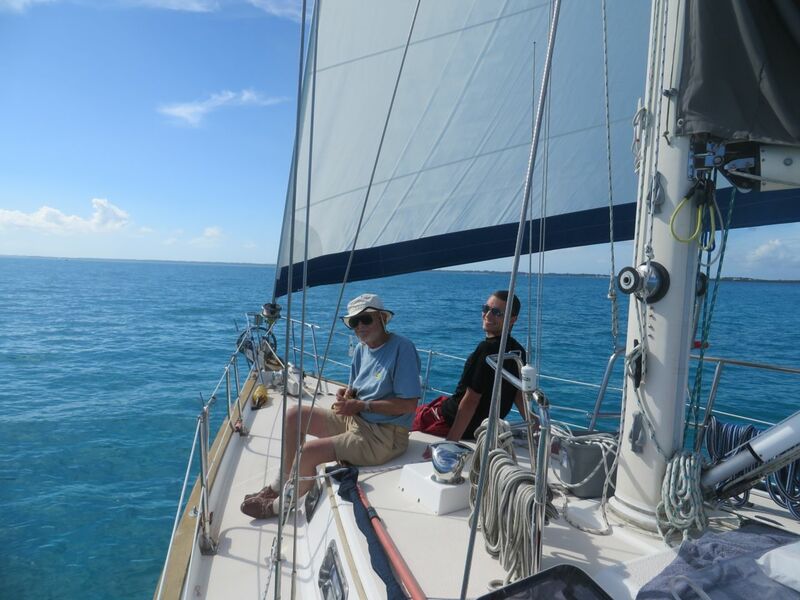 We were having a good time, with or without winds. We placed 5th! OK, there were only five boats racing so I guess that isn’t impressive. 😉 But we had great fun together and enjoyed the camaradie on the water. AND, WE WERE SAILING FOR THREE HOURS!!!!! WooHoo! 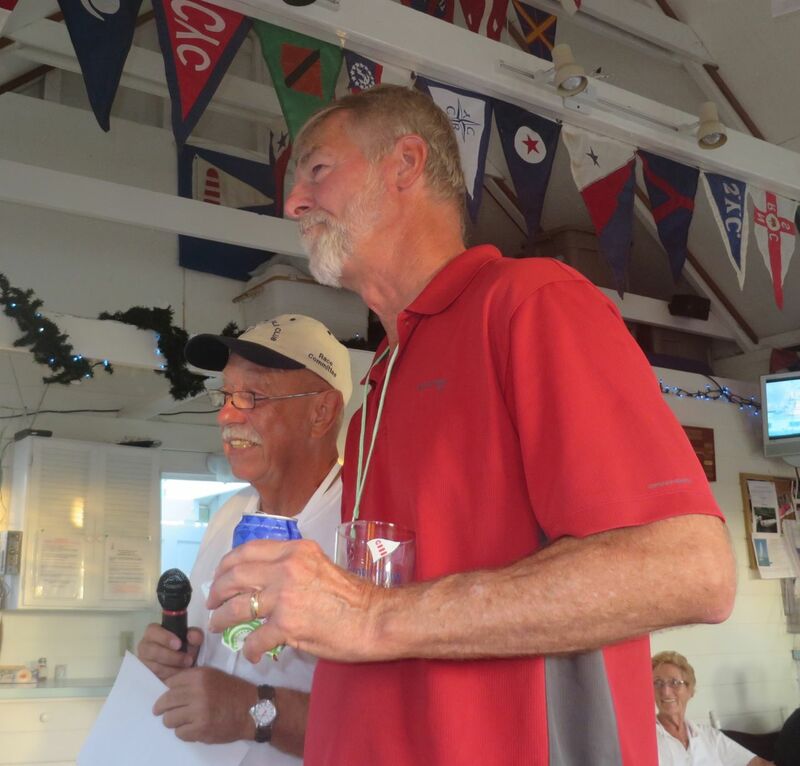 At the party later that day, Al and Kindred Spirit were honored with the”good sport” award for finishing the race (announced on the VHF the next morning) and given an HTSC glass. 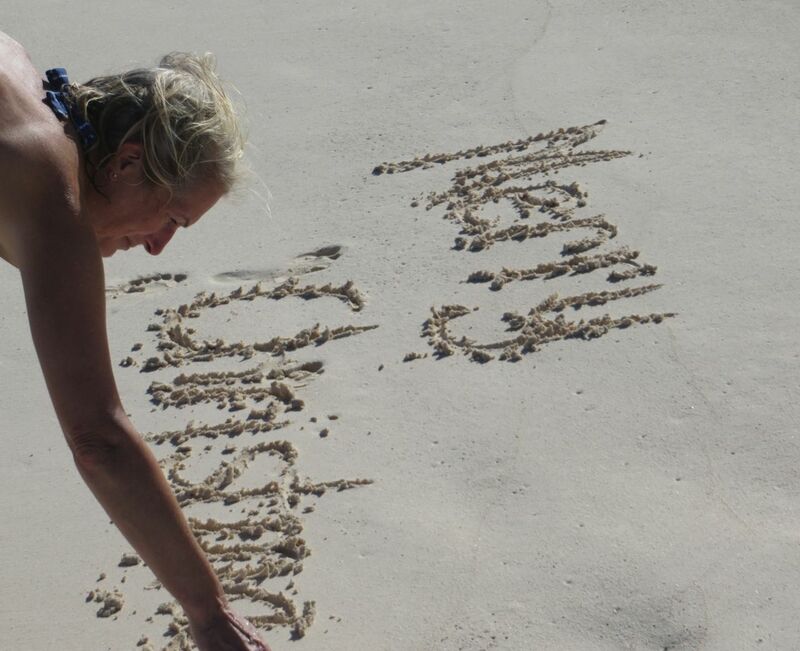 A “Merry Christmas” written in sand is as cheerful as one written in snow. If we cannot be at home with our family this year, Hope Town is a good substitute. As I described in an earlier post, the Christmas spirit is alive and thriving here. Our Christmas Eve began a day early as we walked the north beach again, watching and listening to the waves. 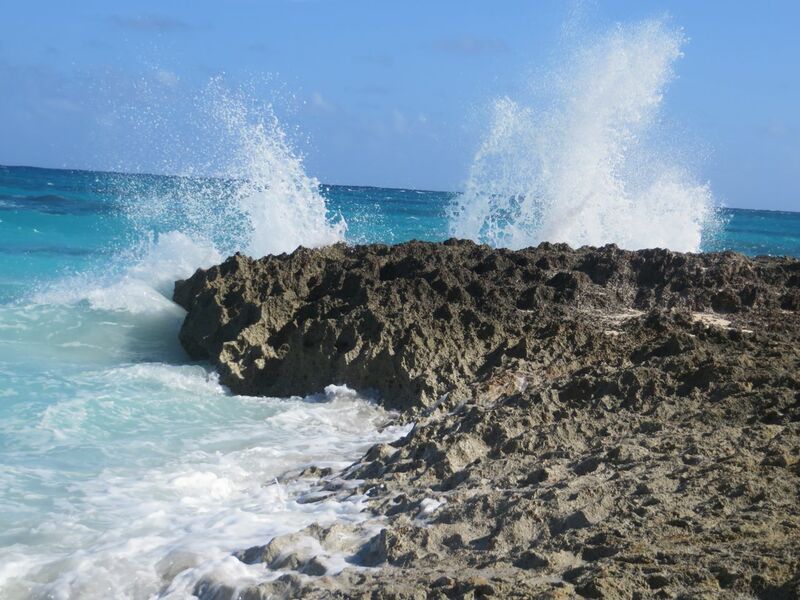 The surf was a great show as it roared up against the reef rock. 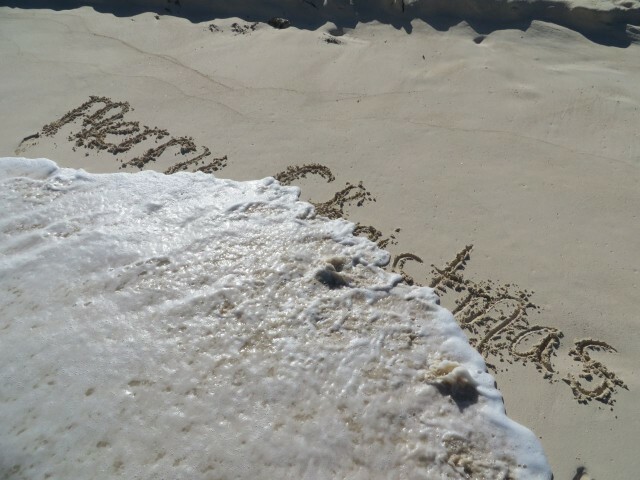 In just a few days, these waves have eroded some of the beach, leaving a little sand cliff. 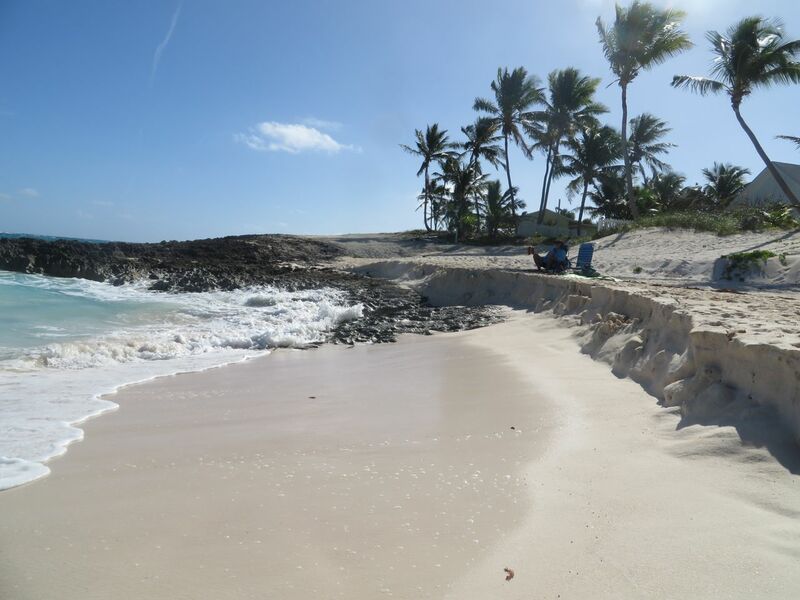 That’s Mother Nature – always changing our scenery. Al is able to sit and watch that water for hours! Our Christmas Eve became a little busier than we expected – busy in a very, very nice way! 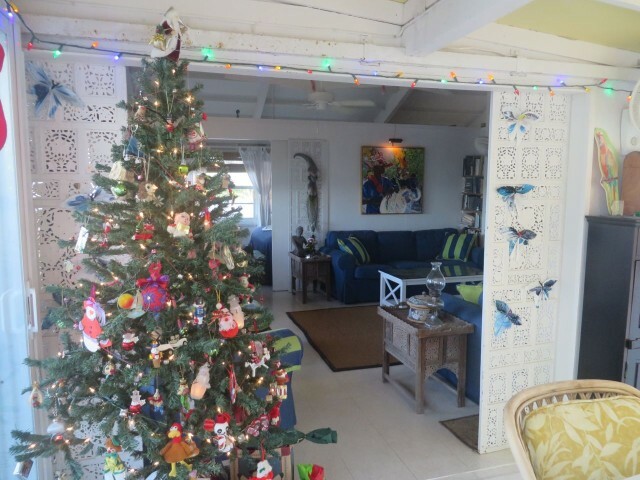 Deanna and Sara, who live in Sea House, invited us to a spur of the moment holiday open house. 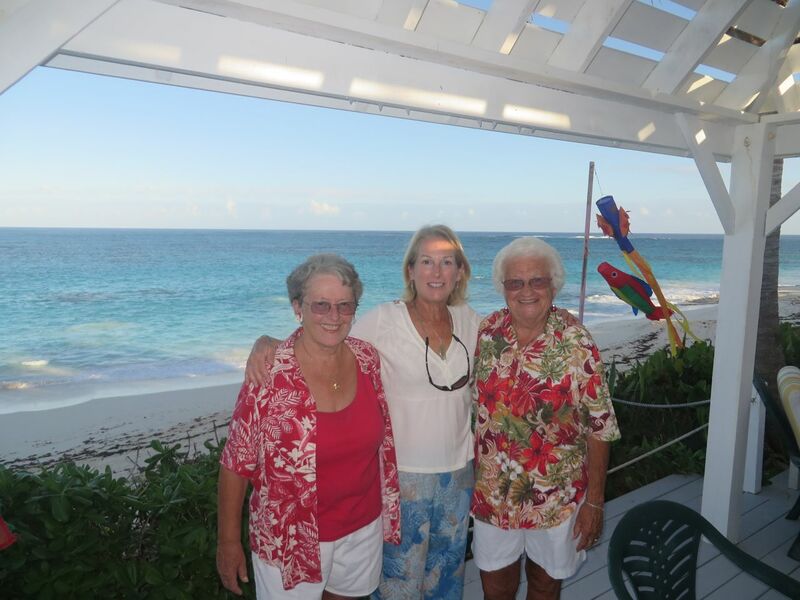 Sara and Deanna are two remarkable women and their home reflects their personalities, warm and inviting. Sea House sits above north beach with a view that is almost heaven. 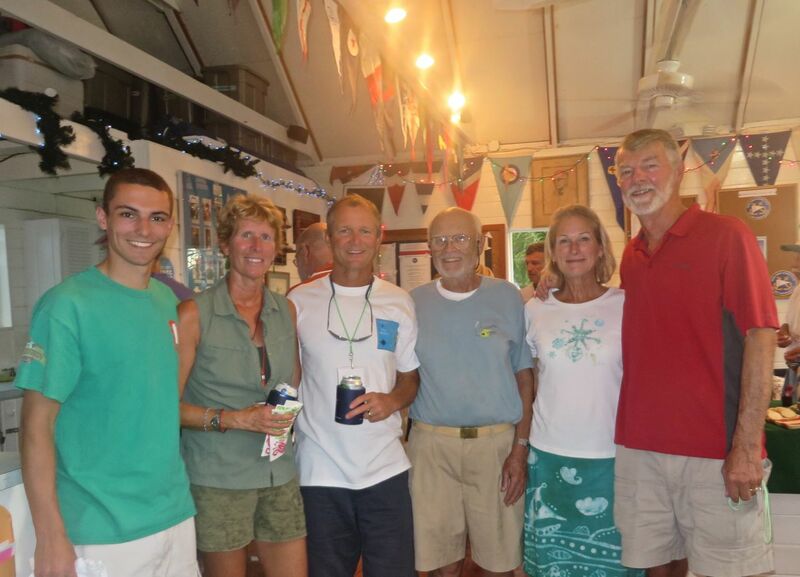 We enjoyed socializing with our new friends and meeting even more charming people. Thank you, Sara and Deanna, for a delightful holiday party! Sea House shines with Christmas spirit! 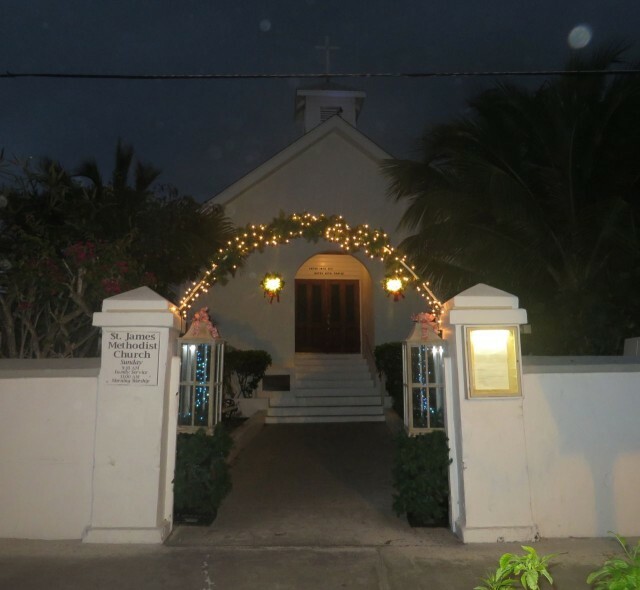 With our tummies full, we hopped into the dinghy and headed into the settlement for the candlelight Christmas Eve service at St. James Methodist Church. 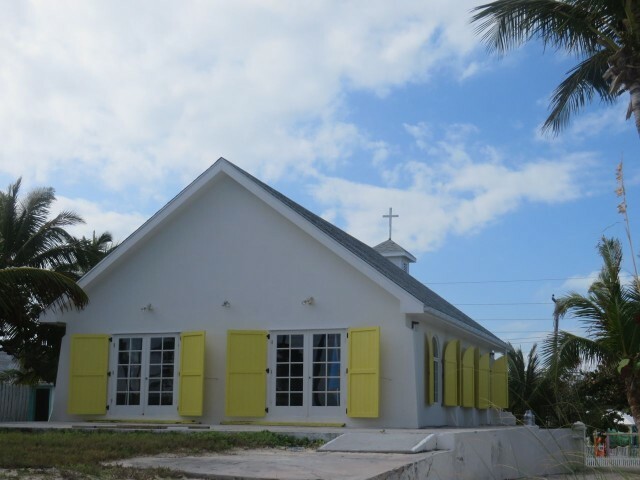 St. James, a charming little church, overlooks the Atlantic Ocean and has been rebuilt four times since it began its work in Hope Town in 1820. 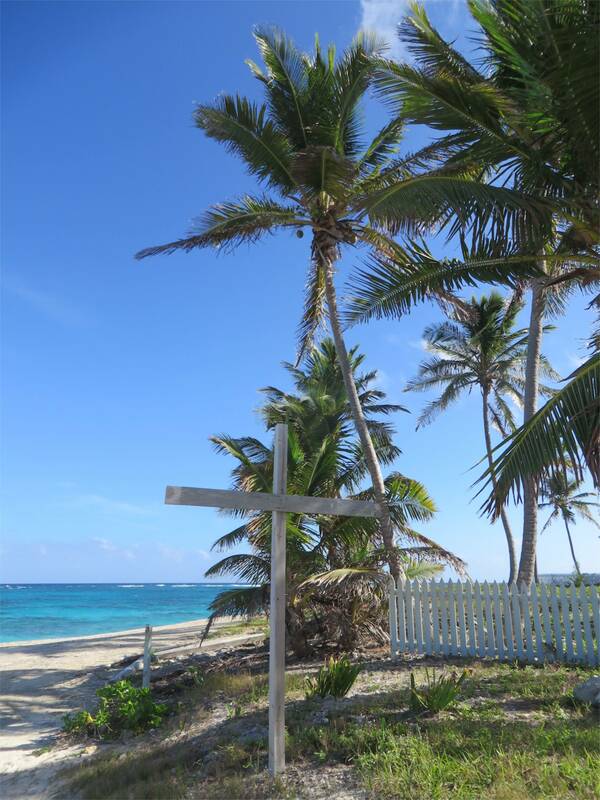 The view of St. James Church from the beach. St. James’ cross stands tall along the path down to the water. 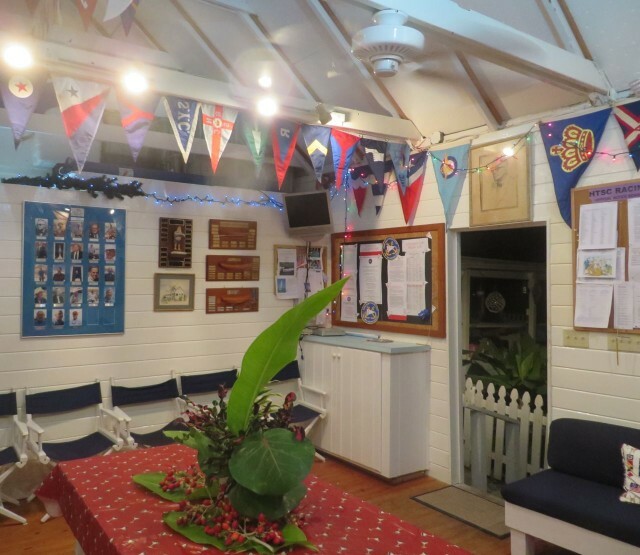 The service was just right – lots of carols, Christmas Bible readings, a good sermon, and overflowing with people, about 150 adults and children. 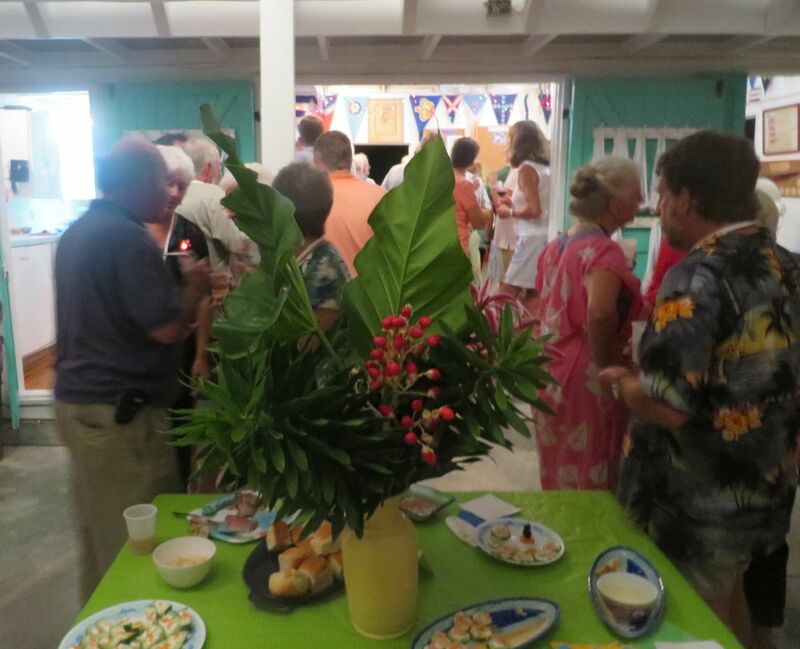 The altar was adorned with natural greens and plants from the island. The service ended with only the glow of the light from the candles held by each person. I am so glad the four of us went to the service. Christmas morning brought a change in the weather – windy and cloudy with a shower as well. But no snow. 😉 We ate peach pancakes with sausage,followed by skyping with our friends on Magnolia, Anthony and Annette. 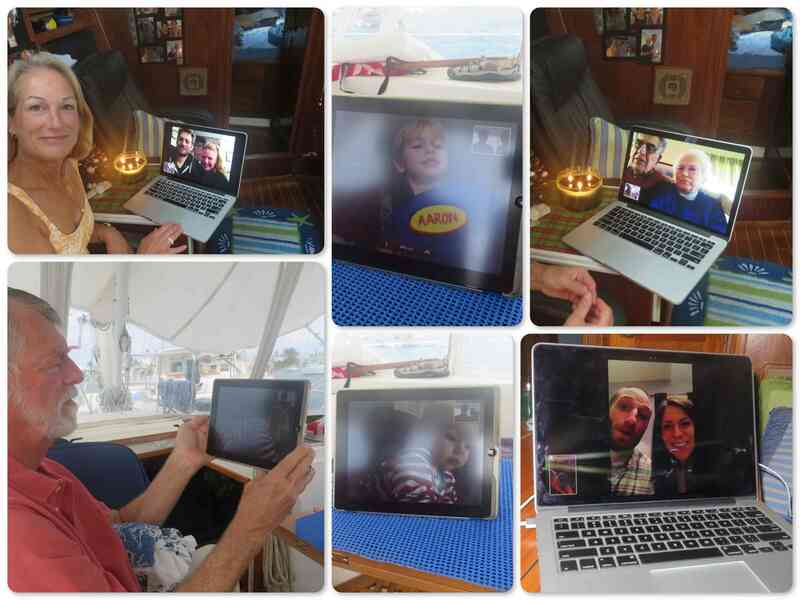 Later, after dinner, we skyped against that we could also wish Frank and Mary Marie a Merry Christmas. Magnolia and Eleanor Q are together in Fort Lauderdale and hope to cross to the Exumas sometime next week. The internet allowed us to “Face Time” with our family, closing the many miles between us for just a short time. It really helped to make the day a little brighter. 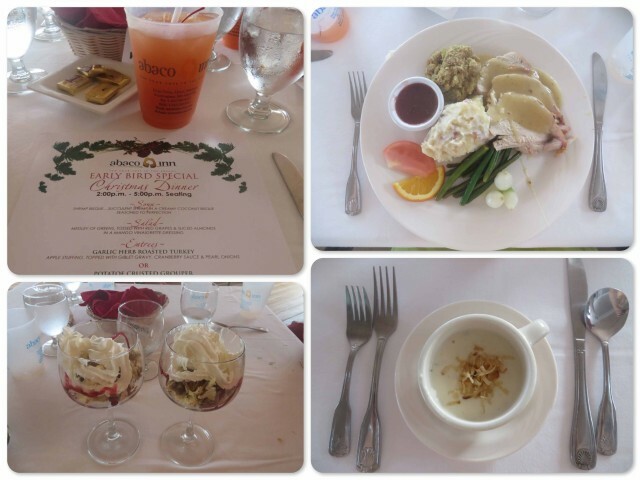 We had carefully planned our Christmas eating and activities with Cutting Class to spread it out over the two days. For Christmas Day we made reservations at the Abaco Inn for an early dinner. Holidays are about the food, right? So here is another food photo collage – dinner was delicious and very filling. ~No photo of the salad – forgot! ~ We had a very nice Christmas dinner together! Just like all years, Christmas ends too quickly. 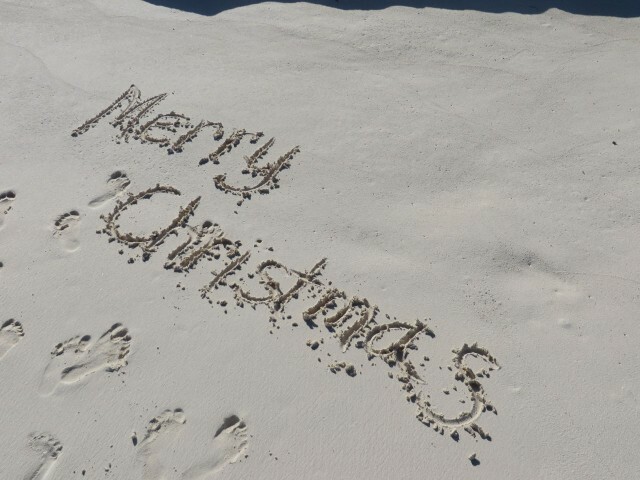 Each Christmas becomes a memory that joins the ones that have come before. All together these memories create a glow that warms us, filling us with joyful memories of times spent with family and friends. OK, “children” — next year, it’s back to our house in Connecticut for Christmas Eve dinner! !